We're having elections Week 9 Thursday (7th March) at MS.05 7-10pm, so save the date! Elections are a great chance to get involved, whether you decide to run for a role or not, come along to have your say in the future of the club. Details of the roles you can run for and the current exec can be found in the Google Doc link below please do get in touch with any of the current exec if you have any questions! If you decide to run for a role, please let Gemma Walton know in advance. Important point: You require club membership 3 days before elections take place - a list will be printed 3 days before and names will be taken on arrival. Anyone NOT on the list will not be allowed into the venue. When it is time for each position to run the candidates nominating themselves will be asked to stand. Speeches will be given in alphabetical order by surname - if the position is contested all other nominees will be asked to step outside). Once your speech begins you will be given time warnings of 30s and 10s remaining - you are not allowed to go over so make sure you practice! Nominees will then be asked questions by the outgoing exec and the audience. Once all nominees have given their speeches they will be asked to leave the room while votes are given and counted. Nominees will be asked to come back into the room once the votes are counted and the new elect will be announced. Good luck & see ya there! Well done to Squish Sqwash Squash (aka Team 8 ) on winning the finals today!! Well deserved medalists at the end of a great day for Warwick Squash! Thank you to everyone who turned up and played, it was great to see so many of you. And thanks to all for playing in this league this year! Once again, WarwickSquash have prevailed over Cov with a 5-0 win! Also with the win in the first ever Women’s friendly! Thanks to everyone for coming to support us, and also well done to the rest of Team Warwick for our biggest win against Coventry so far! 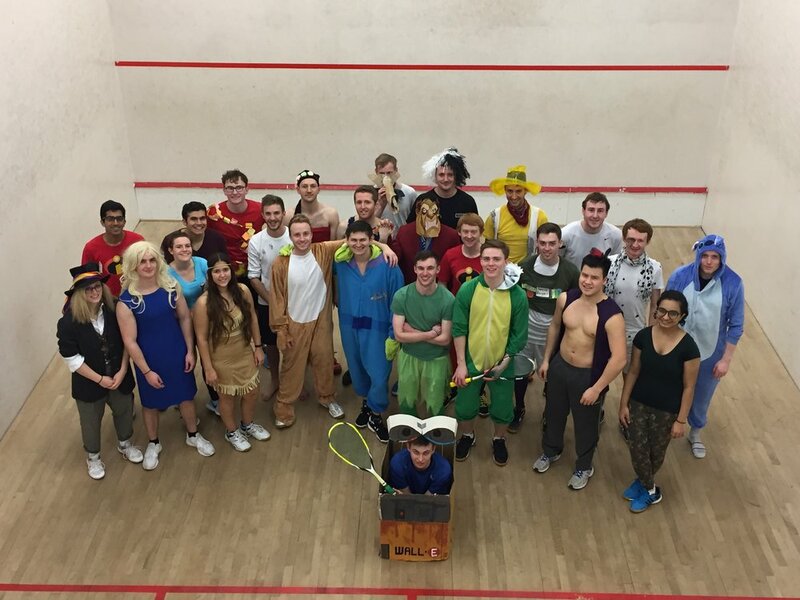 WarwickSquash are looking to do their part and hopefully bring home a win for #TeamWarwick in Varsity this year for the 29th year running! Don your best red t-shirt and come along to watch our Men's First Team at 12:00 TOMORROW! For the price of a mere £16, you receive eight sessions (one hour a week) from week 3 until the end of term – you won’t find a better deal anywhere else! AND continuing after its successful trial in term 1, the women’s only coaching is returning still at the absolute steal of £5 for the term. If you want to try before you buy, come along Tuesday 15th January to see if it’s for you! Thank you to Sarah-Jane Perry who attended our Monday morning Performance Training Session! WarwickSquash now has a SECOND WOMEN'S BUCS TEAM who will be playing in Divison 3 in the upcoming academic year! This is an incredibly exciting prospect for WarwickSquash - thank you to our dedicated Women's Team and Squad members from last year and all the years before who have made this possible! In February 2018 our President Gemma travelled up to Manchester to take part in the England Squash promotion day for the #SquashGirlsCan Campaign. To see what Gemma had to say just press play on the video below! As a result of this WarwickSquash will be offering Women's only coaching sessions EVERY TUESDAY from 18:00-19:00 throughout terms 1 and 2! So keep your eyes peeled for more information about how to sign up! Once again WarwickSquash has achieved one of the highest Sportmark accreditations given out by the university, receiving Gold, Gold and Silver two years running! (Competition - Gold; Community - Gold; Participation - Silver). It's been a good year! 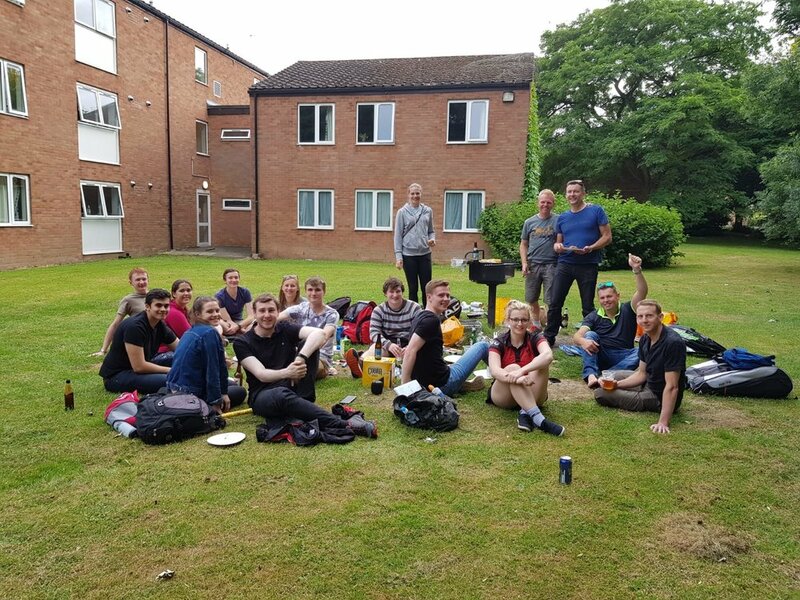 Thank you to everyone who came to our events this year - to those leaving us this summer good luck in the future and to everyone else, see you in October! On Sunday 24th June 2018, Squash, Table Tennis, Badminton and Tennis battled it out to become the Racketlon Champions 2018! Teams of ten competed across each sport playing one game to 21. It was an incredible day that brought our sports closer together! Thank you to all the participants and organisers for such a great day and hopefully this will lead to a bigger collaboration in the future - so watch this space! The Alumni Event is back! And once again it was proven that youth does not always overcome experience. Thank you to all of the alumni and current students who attended the event - we hope that everybody had an enjoyable afternoon! "This year WarwickSquash went to Budapest for our annual tour. Squash and a culture trip combined this was perhaps the best week of the year!" Any candidates running for President shall give a 5 minute speech and everyone else gives a 2 minute speech. Social Secretaries MUST run as a pair. Tournament secretaries must run individually and people will vote for the people they deem the best 2 candidates. Check out the Facebook event for more information on the positions and their requirements. Thank you to the massive band of supporters that made the trek to Coventry for this years Varsity fixture! Our boys took the match without even dropping a game and racked up the points for #TeamWarwick!!! Varsity is nearly here! On Friday 23rd February at 16:00 our Men's 1st Team will be travelling to Coventry University Sports Centre to take on Coventry University in this years Varsity. This is not a match to be missed! So be sure to click 'Going' on our facebook event so that we can provide you with more information! INTER-UNIVERSITY TOURNAMENT: TICKETS NOW LIVE! - Prizes for main grade and plate winners and runners-up! Our coaching courses are now available for purchase from the SU website! They will run from weeks 3 to 10 and are aimed at Beginners, Intermediate and Experienced levels! Thank you to everyone that came to the Alumni Doubles Tournament of 2017!!! 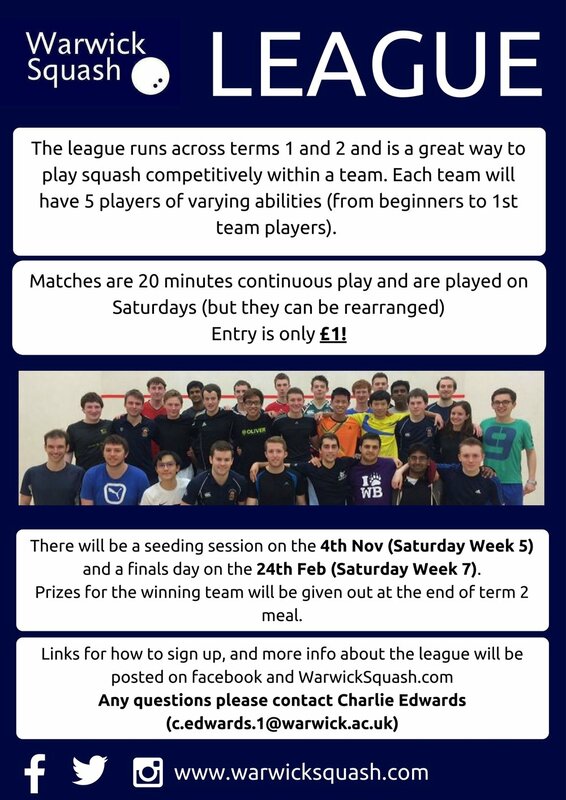 The WarwickSquash League is a great way to get involved in the club, and gives players of all levels the opportunity to play in a team format. The seeding for the League will take place on Saturday 4th November between 12 and 4pm! League membership can be bought below for a bargain price of only £1!!! ALUMNI DOUBLES TICKETS ARE NOW LIVE!!! Don your best outfit and get ready because Alumni Doubles is FINALLY here!!! For safety reasons the tournament is only open to Squad members and above (and of course our beloved alumni) - HOWEVER, this should not stop you from joining us at Circle and Skool Dayz in the evening!!! TICKETS GO OFF SALE at 22:00 on Wednesday 15th October - so get buying!!! **Even if you aren't playing in the tournament please buy your Skool Dayz ticket through the link below so that we can accurately inform the SU of numbers. If you have any questions at all about your eligibility to enter the tournament please feel free to contact our VP of Sport, Gemma Walton (G.Walton.1@warwick.ac.uk). Thank you to everyone who played in the Non-team tournament this week!!! We'd like to say congratulations to all of those who came and played at the Finals Day and the final results are in! Winner of the A Grade, Will Dougie (Left) receiving his trophy. 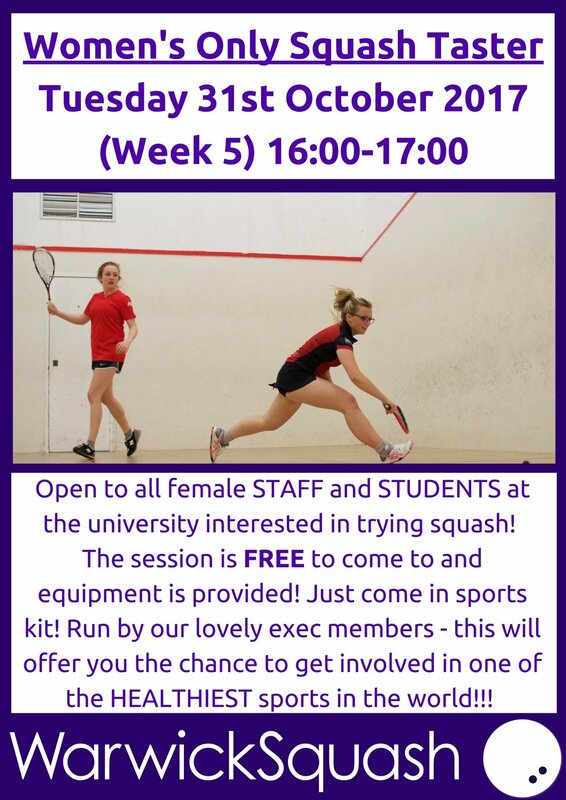 WarwickSquash are providing all women at the University the chance to get involved in Squash. The session is free to come to and the club will provide rackets and balls! All abilities are welcome and exec members will be on hand to give advice and help out!!! This is a great opportunity to experience Squash and we hope to see as many people there as possible!!! NEVER PLAYED SQUASH BEFORE? ONLY PLAY EVERY ONCE-IN-A-WHILE? OR HAVEN'T PLAYED IN A LONG TIME - THEN WE HAVE SOMETHING FOR YOU! SQUASH 101 LAUNCHES THIS FRIDAY! From 6pm-7pm EVERY FRIDAY WarwickSquash will be running Squash 101 sessions on courts 5 and 6 in conjunction with WarwickSport's Rock Up and Play Scheme. FREE for all first year undergraduates and postgraduates AND MEMBERS of Warwick Sport. Squash 101 is a great way to improve your squash - and have fun at the same time! Be sure you don't miss out!!! 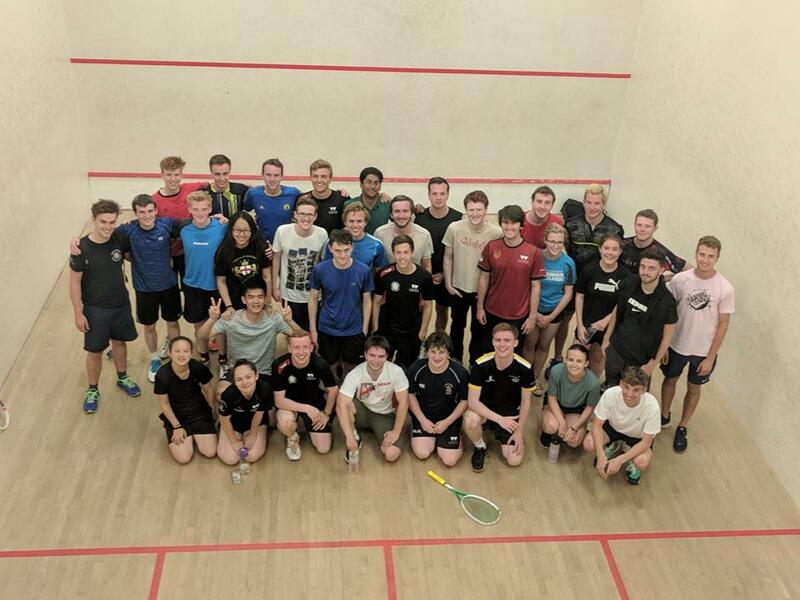 After a very successful Welcome Week taster session yesterday with just shy of 50 people rocking up to try their hand at squash: WarwickSquash invites YOU to our taster sessions which will be held on Tuesday and Thursday in both Weeks 1 and 2 from 19:00-21:30. There's no need to own a racket as they will be provided by the club - just show up in sports kit! 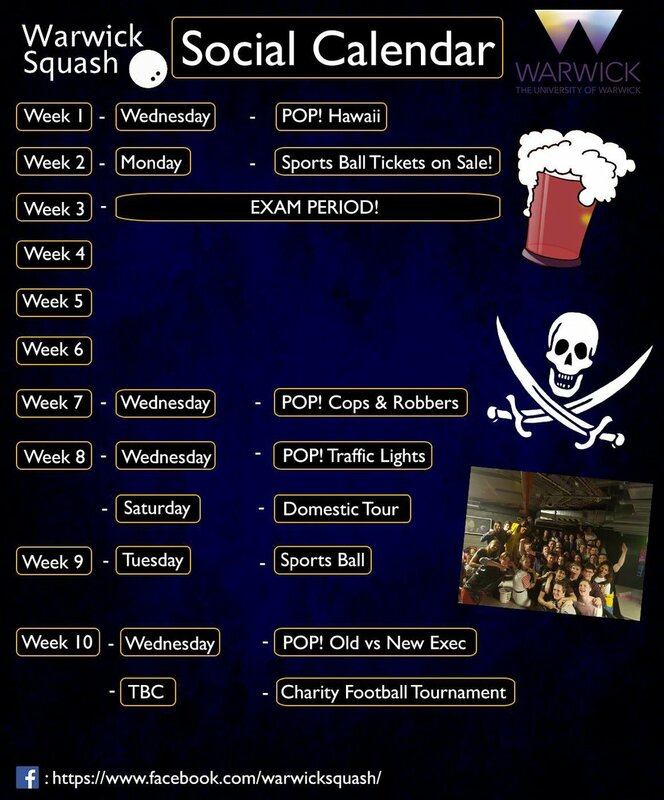 With the new university year starting next week WarwickSquash are back in business and will be offering fantastic socials every single week! Here is our packed social calendar for Term 1. Including the Academy of WarwickSquash, the biggest most anticipated social of the year which MUST NOT BE MISSED!!! Get these dates in your diary because you don’t want to miss out! Everyone is welcome and it’s never too late to get involved! Be sure to join the WarwickSquash group (https://www.facebook.com/groups/105750183115016/ )and add Elise RW (our VP Social) to be invited to events and keep up to date. The Ladders are free to join and allow you to play matches against other club members of a similar ability. All you have to do is create a squashpoints account here. Simply challenge someone on your ladder and record the core online! 1) Like our Facebook page and keep checking the website to see what WarwickSquash can offer you! 2) Look at our first three weeks of socials in the calendar and links below, and CLICK GOING - make sure to come along, meet the club and (we hope!) have a great time. 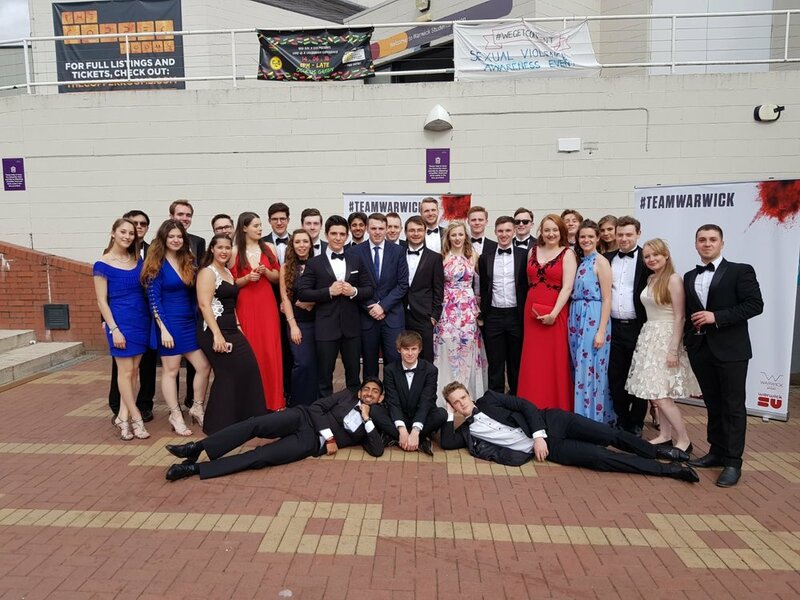 3) Add Elise RW (our Socials VP) and join the WarwickSquash group to make sure you are invited to all of our socials this year! Follow the links below to find these events on Facebook, or see our events page! In partnership with Kenilworth Squash Club - WarwickSquash has been announced one of two new teams to be playing PSL in the upcoming season!!! This is one of the most prestigious squash leagues in the world. It hosts only 12 teams and features some of THE BEST players in the world. Home matches will be hosted at Kenilworth Squash Club: Keep an eye out for dates and ticket prices!!!! 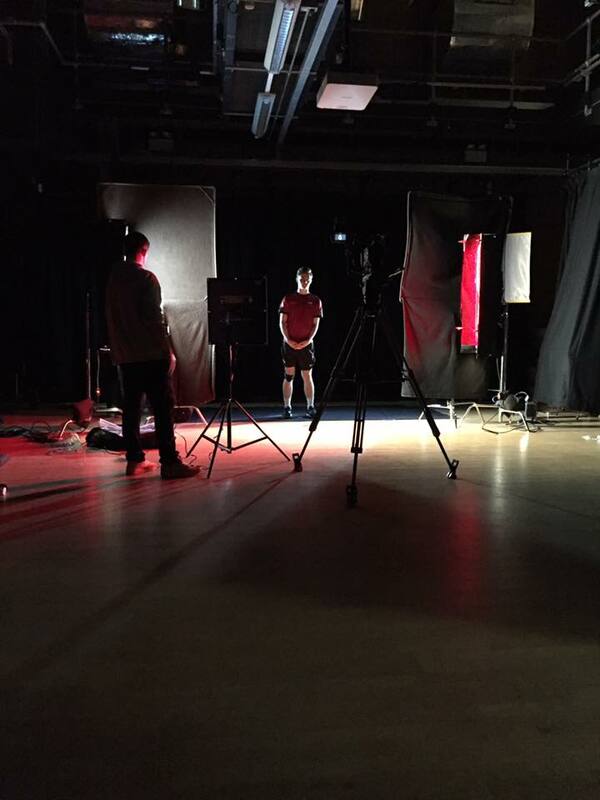 Once again WarwickSquash has the honour of being deemed a 'performance sport' at Warwick University. Meaning that as a club we are one of the top competing clubs within the university. This provides extra training for our first team players and allows us to continue competing at a high level. For more information on how to become a performance team member please contact us! At the end of the academic year, Sportmark accreditation is released - each club is marked on Participation, Community and Competition. And for the third year running WarwickSquash have achieved the highest sportmark accreditation at the University, achieving Gold in both Community and Participation and Silver in Competition. Not only is this the highest mark of the year BUT THE HIGHEST EVER AWARDED AT WARWICK!!! This is very exciting news for the club and makes us proud to be WarwickSquash!